Les Arcs apartments with pool, self-catering accommodation, ski holiday rentals, holiday lets in Les Arcs, ranging from a 1 bedroom apartment for 4 to a 3 bedroom apartment for up to 10 people. You can ski in and ski out of all of our superb Les Arcs 1600 ski apartments which also have free use of a swimming pool and recreation facilities including billiards table. Les Arcs enjoys exceptional sunny snow conditions and an impressive array of skiing possibilities on the 425km of groomed ski runs, with an overall descent of 2400 metres from a summit of 3250m, which make up the Paradiski ski pass area. The Les Arcs resort is comprised of a number of villages beginning with Bourg Saint Maurice which nestles in the valley at 800 metres and links up to 1600, 1800 the newest addition 1950 and 2000 then over to Vallandry and Villaroger. Les Arcs has enjoyed considerable investment in recent years which has boosted its standing even further as a top ski resort. Its vast ski area, slick infrastructure and incredible variety are the key factors to its popularity. Each Les Arcs village has its own character and all interlink very smoothly and its link to La Plagne in the late nineties radically opened up the skiing on offer. There is an unbelievable array of skiing on offer with 36 beginners runs, 66 intermediate and 129 advanced. There is are 3 snow parks and a pipe as well as night skiing. Les Arcs opens from early December to end of April (varies year on year). We have 2 apartments in Les Arcs. There is an awful lot of skiing which favours the intermediate and advanced skier (mogul bashers should tune into the mogul field under the Comborciere chairlift) but the learning facilities are very good, above all aided by the speedy, comfy chairlifts which make learning in Les Arcs such a pleasure. 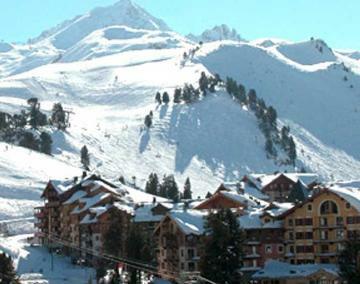 This really is one of France’s best ski resorts. Les Arcs is located about two hours drive from Grenoble which has direct flights with either Easyjet, flythomascook or Ryanair from Luton, Stanstead, Gatwick, Bristol, Liverpool, Birmingham and Manchester. There is a wide range of additional outdoor activities on offer at Les Arcs including dog sledges, cross country skiing, Helicopter skiing, off piste, outdoor ice skating, snow scooters and snow shoe trails. These are complemented by bowling, squash, fitness centres and discotheques. There is a good range of shops (the best value ones are down in the valley in Bourg Saint Maurice), bars and restaurants although as a mainly family resort it’s not particularly strong on night life. Ski lessons are available with the ESF.